Quick show of hands, who’s NOT looking forward to TLC’s new season of Who Do You Think You Are? By the way, thank you for the WDYTYA viewing party invitations. I can’t wait to see the new season! Before we overdose on a new season of Who Do You Think You Are, I want to draw your attention to a simply fabulous BBC series called Turn Back Time: The Family. I stumbled across it on YouTube last month, and I absolutely adore it. To my readers in BBC land, my apologies. As BBC America has yet to feature this show in a timely fashion, I have discovered this show (and many others) several weeks, months, or years after their air date. The premise of Turn Back Time is simple. Three modern families live week by week through successive time periods, all within a single block of Victorian housing in Morecambe, England. The catch: their living conditions and and social status is dependent upon those of their ancestors in the same time period. Thinking of being sucked in to the world of your great-great grandparents, and seeing the world from their point of view for a week! How could a genealogist not watch this show? The families selected for the program were for the most part unaware of their genealogical backgrounds, so it was a big reveal to see where each family would fit in the social and housing pecking order at the beginning of each episode. 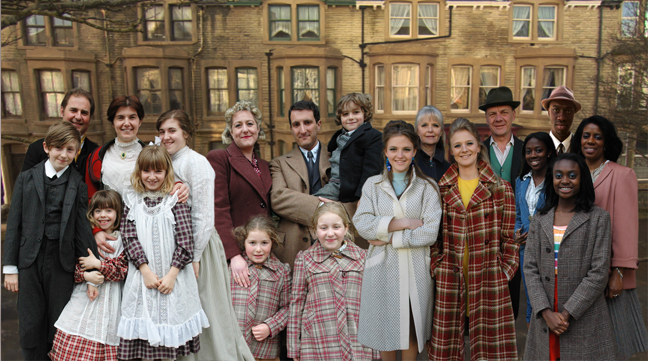 Over a series of five weeks, the families progress from the Edwardian period with its strict adherence to social conventions to the dramatic social changes of the 1970s. Each era brings opportunities and difficulties, both social and economical. Each resident of Albert Road is expected to live within the social means and norms of their situation, and have three historians to lead them through each time period. You can read a wonderful bl og post from Turn Back Time – The Family participant Ian Golding, and offers a great account of the show and the amount of effort it entails. Ian and his wife Naomi adjusted their modern parenting style to each era’s parenting techniques, which was an eye opening experience to both the Golding parents and their young children. I was also intrigued by an earlier program Turn Back Time – High Street, where modern shopkeeping families experience life on the high street (downtown shopping district) in various time periods, namely the Victorian era, Edwardian era, 1930s, Second World War, 1960s and 1970s. This show has two focuses, immersing the shopkeepers in the period joys and pitfalls of their professions, while courting favor with modern shoppers. You can view one full series on Vimeo: Turn Back Time – High Street (Edwardian Era) . I haven’t been able to find additional full episodes of this series, so if anyone has a lead please let me know! Without giving away too many spoilers you can read My experience of Turn Back Time: The High Street by Karl Sergison. Warning! It contains spoilers! How many of you would step into the living conditions and working professions of your ancestors? Leave your comments and thoughts here on our blog! As a quick side note, PBS’s Genealogy Roadshow is casting right now, and you can find information on the second season online. Hi Debra – this is Ian Golding here. Thank you so much for your kind words about my Turn Back Time blog. Our experience was one that can only be described as an amazing one. If we could do it all over again we would! If you have any questions about the Turn Back Time, please do not hesitate to ask.